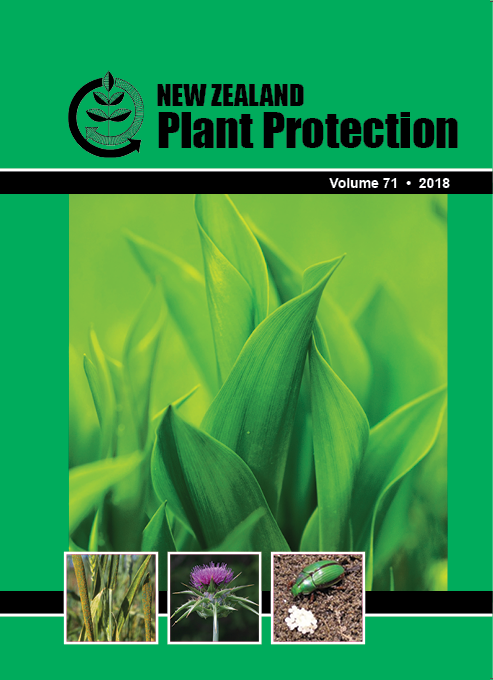 Almost all of the original native vegetation of Canterbury Plains has been replaced with an arable landscape of managed exotic vegetation. A previous study planted small areas of native trees on arable farms in 2013 to enhance the abundance and diversity of beneficial insect crop pollinators. The aim of the current study was to assess insect flower visitation at three sites in the fifth year after planting. Weekly standardised surveys of native flower visitors were conducted between September 2017 and February 2018. A total of 2349 insects from 37 taxa were observed within three native plantings. Native bees (Lasioglossum sordidum 20%) and the honey bee, Apis mellifera (19%), were the most common followed by the large hoverfly, Melangyna novaezelandiae (16%). The calliphorid flies, brown blowfly Calliphora stygia (8%) and blue blowfly Calliphora vicina (6%), were also well represented. The most abundant insects visited four or more of the eight study plant species. Most (52%) of the flower visitors where natives. Many of these insects are known crop pollinators and it is likely that they assist with crop pollination.